Click here to visit the Pine-Sol facebook and like them because for every every two “likes” Pine-Sol gets, they will donate one book to a child or family in need – up to 5,000 books. They’ll also be donating $40,000 to Reading Is Fundamental. 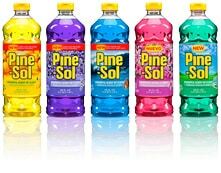 Pine Sol has always been my cleaning product. Love them scents and value. Just an all around GREAT product. Thank You! Thank you, Pine-Sol company, for this wonderful gesture!